This month’s pick for Food ‘n Flix is Mistress of Spices. I had not heard of the movie before Camilla (the June host for Food ‘n Flix) suggested it. I am glad I sought it out. A mystical and beautiful Indian spice mistress finds herself stationed outside of San Francisco. Her charge? Dole out spices, wisdom, and remedies to her Indian community and beyond. Because of her “vows of spices,” she cannot ever leave her shop, touch another human being, misuse or ignore what the spices tell her, or fall in love. Enter Dylan McDermott’s character. I did enjoy this film, but am glad I watched it without The Hubs. It is definitely a chick flick (not that there’s anything wrong with that) and watching it solo saved me dealing with some eye rolling and “That would never happen” statements. So, I found a day at home alone and watched it. For the past Food ‘n Flix films, I have tended to watch them with paper and pen in hand to jot down great quotes or recipe ideas. I started out trying to record every spice mentioned and what its attributes were and I even tried to copy down the ingredients Tilo lists to the love-sick karate teacher for Baingan Bharta . But, I soon put my pen down and simply relaxed and enjoyed the film. Who cares if this is not real life, if this would never happen, or if it were pure fantasy? It definitely got me thinking about how food is often paired with mystery, magic, and love in literature and film. I know that I will be leaving something out, but here goes nothing. I started a list in my head of the food and fantasy genre. Even with some non-fiction, like any of Marlena de Blasi’s books, there is that essence of magic when it comes to food. But enough of my ramblings. Let’s get on to some food inspired by Mistress of Spices. As I scoured my two big Gourmet cookbooks for Indian fare, I found that most of the recipes required baking or roasting. Doh! I really needed some kitchen magic. My “new” oven (which is less than a year old) went on the fritz and the repairman told me the part wouldn’t be in for 7-10 working days. What? I have recipes to cook, blogs to posts, clubs to keep up with. Heat a dry skillet over moderate heat until hot. Add all spices and toast, swirling and tossing frequently. Cover skillet when mustard seeds start to pop! Toast for 3-4 minutes total time. Those mustard seeds will really pop everywhere. Do cover but be careful not to burn. Let cool and then grind to a powder in a spice grinder. Stir together Garam Masala, salt and pepper. Pat steak dry and coat flank steak with spice rub. Let it set out at room temperature to marinate in the spices for about 30 minutes. You can heat the grill up while you are waiting. Cook over medium hot coals (or over direct heat if using a gas grill). Grill for 12-15 minutes, turning once. 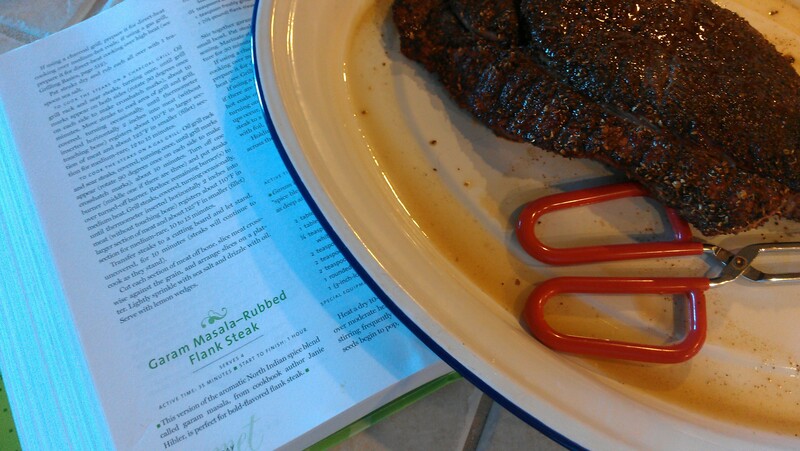 I could not find a flank steak or skirt steak that wasn’t “pre-tenderized.” I had to use a London broil for this recipe. Slicing it thin worked out okay. Remove and tent with foil and let rest for 10 minutes. Slice steak at an angle, cutting across the grain into thin slices. 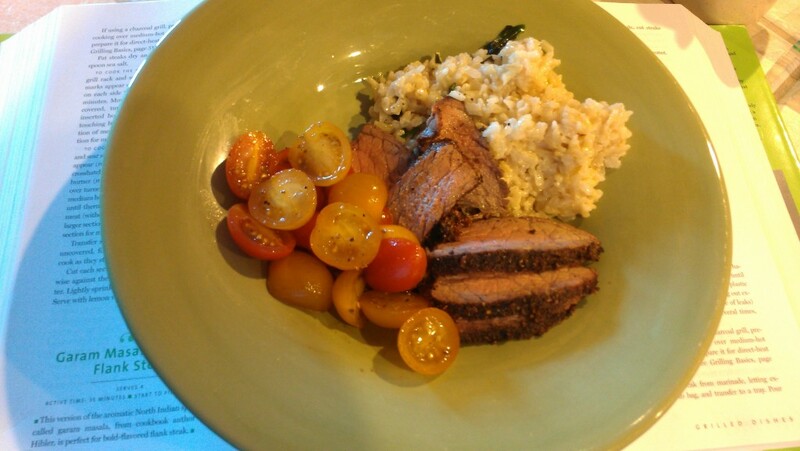 Serve with Mixed Cherry Tomatoes with Tamarind Dressing and coconut rice. For coconut rice, I just use coconut milk and water and cook like normal, stirring in some basil at the end. Maybe the movie itself was magic to inspire me to cook an entire dinner with one theme (but I am sure I am mixing my regions because I think garam masala is a North Indian spice blend and I am pretty sure that coconut rice is associated with southern India). My recommendation? Make some hot and spicy food, invite the girlfriends over, ban men for the evening and watch this beautiful film. Make sure you check out all the great recipes inspired by Mistress of Spices at the Food ‘n Flix roundup. Next month’s film is Beacause I Said So and is hosted by Girlichef. Do you think there should be a new genre for food and fantasy? What films or books have I left off this non-definitive list? Please leave your comments below. Postscript: Mix any leftover tomatoes in with any leftover rice! Eat the leftovers hot or cold. Delicious! Dylan McDermott is just hot, isn’t he? I’ve never heard of the film, but will check it out on Netflix. Your film-inspired meal looks absolutely delicious. How does one become part of this group? Yes, he is hot! I will send you an email about how to become part of the group but it is pretty easy. I think that i found it through one of the Cook the Books participants. Pretty cool group of bloggers! Congrats on your win with Cook the Books! Loved your post on this book. Yeah, I ought to have commented this on your actual post but I am lucky to have gotten online today and wanted to visit quickly. Nice steak here….goodness, I don’t remember last time I had one but this sure is inspiring. Thanks, Tina. Sorry you are having such internet issues. Those flavors look divine for that piece of meat! I loved branching out with this recipe. Thanks for the comment, Elizabeth. Glad to know I’m not the only one. Heather, your popsicles were truly inspired!!!! And loving the movie, I have seen it (but like you, when no one ellse was around :D) – more fun! What a great themed dinner! And a spicy meal with girlfriends sounds perfect 🙂 Have a wonderful weekend, Debra! Your Dorie pics for this Friday were so beautiful. Hot, Hot and mega-Hot. But that spicy steak looks pretty darn hot toooo! Hot for hot summer days! Oh my, I’m ready for a cold front! Seriously yummy there!! 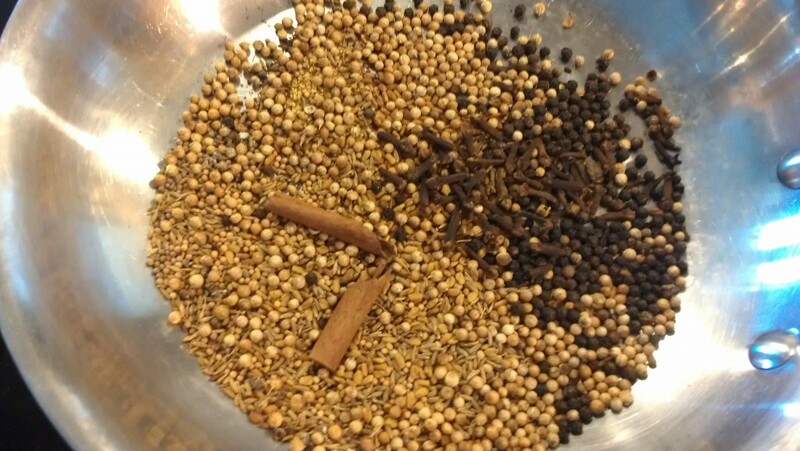 I love toasting and blending my own spices. Your flank steak sounds simply marvelous! Thanks, Glennis! I had some leftover and can’t wait to use it on something else.